Just One More Podcast now on Spotify! My Podcast is now on SPOTIFY! Have a listen- you will learn a ton and be super entertained the entire time. Just One More Podcast is a fitness and nutrition podcast for normal people who want to be more awesome! POWER HOUR + HIIT IT! Summer Celebration Party! HIIT IT! 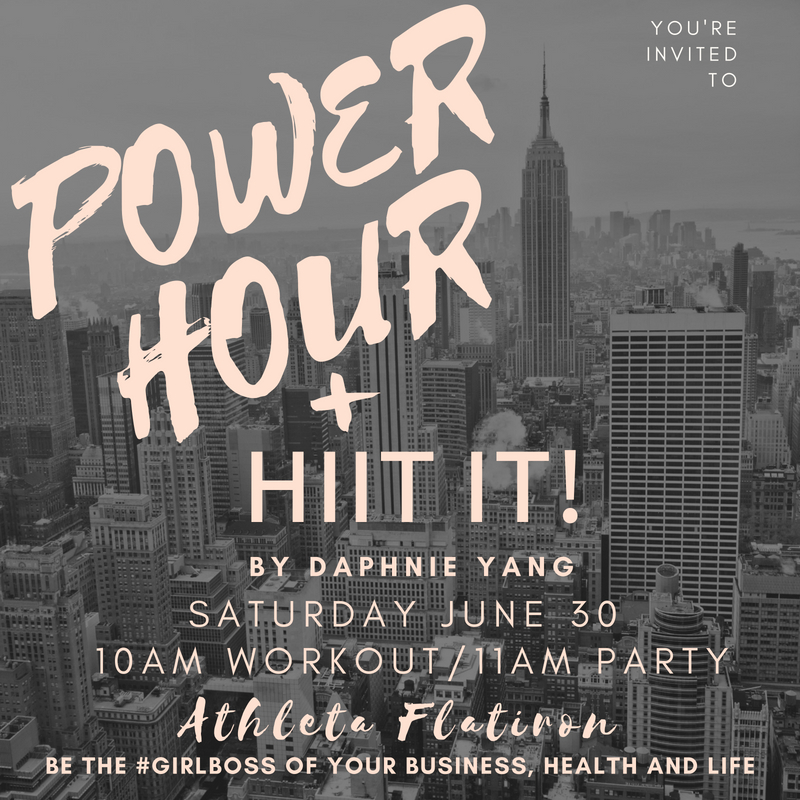 workout lead by Daphnie Yang, followed by a POWER HOUR party! 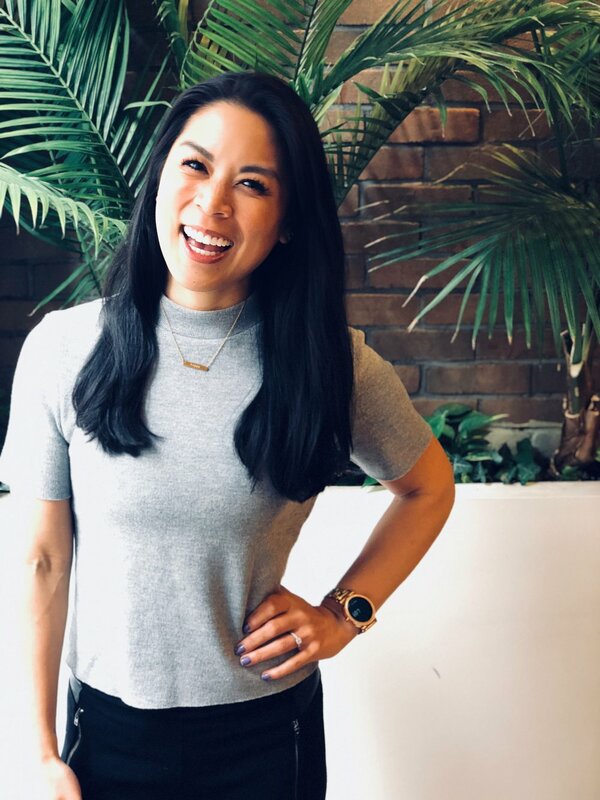 Join for sweat, synergy, positive energy, treats and a chance to reconnect with your favorite #girlbosses! Tickets are $10 with 100% of the proceeds going towards Girls on the Run (www.girlsontherun.org). I was named by ClassPass as one of 10 trainers who will inspire you to follow your passion! Pursuit: A documentary series following individuals in pursuit of their purpose, has captured my story perfectly. In this seven minute documentary I share with you my WHY. WHY I love fitness and WHY I am so in love with what I do. So honored to be a part of this inspirational documentary series. Check out my interview with SHAPE Magazine on the benefits of HIIT and TABATA training! I created a Total Body Core Workout for Womens Health Magazine! Happy Sweating! Introducing HIIT IT! POWER at HYPE GYM! Every Monday and Tuesday at 7PM. HIIT IT! POWER is a fun and sweaty total body HIIT IT! class with a focus on metabolic conditioning using kettlebells, dumbbells and tires. I shot a workout video for the fabulous company Qinetic, follow along for a 30 minute HIIT IT! workout you can do anywhere! What an incredible past few months! I married the love of my life in beautiful Napa, California and just returned back to NY after my two week Fit Fab Honeymoon hiking up to Maccu Picchu! Thank you everyone, for your love and support. Looking forward to an AWESOME December in NYC of HIIT IT! classes and private personal training sessions. Remember, positive energy is powerful and sweat is magic! After the after party! I grabbed all my clients and HIIT IT! students and made them come into the resort gym with me for a #sweatyselfie! Maccu Picchu! The 5 day trek to Maccu Picchu was the most incredible experience of my life! Central Park HIIT IT! is in FULL SWING! Every Monday night 6:45PM, meet on the NE corner of 59th and 7th ave. Outdoor HIIT IT! classes will continue until November 1st. To register for class and view the full HIIT IT! schedule, please visit the HIIT IT! MindBody page. Meet Your Newest Athleta Brand Ambassador! Just signed a year long sponsorship with Athleta! It's going to be a great year representing this amazing national brand! I'm on a podcast! Just One More Podcast is a fitness and nutrition podcast for normal people who want to be more awesome. Podcast Producer/Comedienne Joanna Shaw Flamm and I have been recording this podcast since the end of last year and I can't believe we are already 28 episodes in! We cover a range of topics from sugar, to abs, to protein, to body image. Make sure you subscribe on Itunes. Enjoy! HIIT IT! has been selected to be a part of Union Square Sweat Fest this year! 😅👏💪💦Free HIIT IT! at JackRabbit Union Square Sunday 2/21 9AM. First come, first serve. Union Square Sweat Fest is an annual week long showcase of Union Square’s vibrant health and wellness scene featuring NYC's most sought after classes and instructors presented by the Union Square Partnership/‪‎FitPlusLove‬ and sponsored by Adidas. I created a 4 minute HIIT IT! workout for mindbodygreen, a fantastic health and wellness site! Follow along for a total thigh burner that gets your heart rate SUPER high! Click below for a great workout you can do anytime, anywhere! It's official! HIIT IT! will be at the new Athleta Flatiron Studio every Saturday at 10AM! Best of all, it's free! Come on by, check out the new studio and Let's HIIT IT! Sign up here! HIIT IT! made it into the NY POST! Great article on High Intensity Interval Training and why it's the best workout out there! Meet your new HIIT IT! instructors! Meet Sam, Vinny, Tricia, Leah and Natalie, my new team of energetic, dynamic, knowledgeable and motivating HIIT IT! instructors! Now you can HIIT IT! HARD all week long! All classes held at CAP21 Studios in the Flatiron. 18 West 18th St. between 5th and 6th Ave. 6th Floor. Here is my 4 minute HIIT IT! tabata routine I shot for Gothamista for you to do anytime, anywhere! All you need are a set of 5-10lb dumbbells. Follow along for a heart pumping, fat blasting, calorie torching HIIT workout! FREE HIIT IT! Summer Celebration workout in Central Park! You all know summer is my favorite season, what better way to celebrate it than with a FREE outdoor workout sponsored by Powerful Yogurt, Hal's New York Seltzer and Truebars! FREE! Saturday 6/27 11:45AM. Meet on the North East corner of 59th and 7th ave. Bring water and a towel. RSVP to DefinedByDaphnie@gmail.com, limited spots available!